In post WTO era, sectors of Pakistani economy particularly industry, agriculture and services are increasingly exposed to various challenges. One of the major challenges for low income countries towards adopting the path of sustainable development is the limited enterprise capacity to comply with the international buyers’ requirements. International buyers are increasingly demanding compliance on quality, safety, environment and social standards. Compliance to international and national standards promotes enterprise efficiency and competitiveness through international trade, protects consumers’ rights of health and safety and in turn leads to socio economic development of economy. Non compliance to these requirements often results in loss of business. The following FAQs provide information regarding the process of compliance, requirements and institutional support (capacity building, financial assistance, consultancy, certification and accreditation etc.) available in Pakistan. Why is it important for a business to have compliance certification? 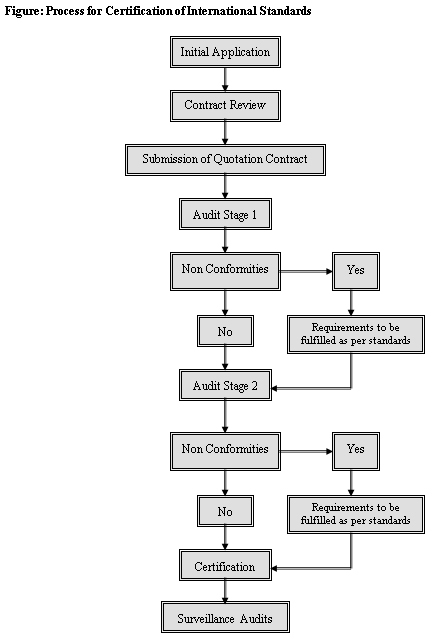 What is the process for obtaining certification of international standards? How much time is required to get certified? How much does a certification cost to a Company? Which are major certifying bodies working in Pakistan? What sort of government support in compliance related activities is available for local SMEs? Which are other relevant websites? 1. Why is it important for an enterprise to have compliance certification? Compliance to international standards on quality, environment and social accountability has been universally recognized as one of the key strategic elements of product competitiveness in both domestic and international markets, along with price and delivery factors. Quality is the pre-requisite for successful market access and for achieving continued customer satisfaction. The Standards and Quality Management program address the quality related needs of exporters and concentrate on institutional and capacity development in the export quality management. International standards are used by companies that either want to implement their own in-house systems or to ensure that suppliers have appropriate systems in place. International standards promote international trade by providing one consistent set of requirements recognized around the world. These systems and standards define and establish an organization's policy and objectives. It also allows an organization to document and implement the procedures needed to attain these goals. A properly implemented systems ensure that procedures are carried out consistently, that problems can be identified and resolved, and that the organization can continuously review and improve its procedures, products and services. For example, ISO 9000 quality management system can enable your enterprise to increase profitability and customer satisfaction through reduced waste and rework, shortened cycle times, improved problem tracking and resolution and better supplier relations. The primary value of this certification is consistent delivery of a product or service to a defined standard and improved bottom line performance. It results into perceived higher quality product/service. The standards are voluntary or are required by the buyers. ISO certification also has a significant bearing on market credibility as well. Enterprises wishing to do business in Europe may have no choice but to adopt it as it is an accepted part of doing business. 2. What is the process for obtaining certification of international standards? It depends on certificate requirements and complexity of the situation; generally 4 to 6 months are required to complete the process of obtaining certification. 3. How much time is required to get certified? 4. How much does a certification cost to a Company? Certification cost may range from Rs. 50,000 to Rs. 300,000. Moreover, consultancy services for certification if required may cost ranging from Rs. 100,000 to Rs. 300,000 depending upon the above mentioned factors. Consultancy may not be required if the staff is competent for carrying out the requirements of implementation of a standard. 5. Which are major certifying bodies working in Pakistan? SMIS Plaza 23, Block P,Commercial Zone, Gate #9, Valancia. 6. What sort of government support in compliance related activities is available for local SMEs? 7. Which are other relevant websites?